The above quote is the quote that best summarizes the book Getting Great Grades. Too often, many students don’t do well academically in school simply because they lacked a goal to earn a certain GPA in school, whereas other higher performing students did everything they could, often with parental support, to earn as high of a GPA as possible. I didn’t do as well as I could’ve when I was in college. My main goal was to graduate in 4 years. I achieve this goal, but because I didn’t have a strong GPA goal like other students, I definitely didn’t do as well as I could’ve. After college, I learned several study techniques that helped me get past my own personal limitations and I became a much better student. 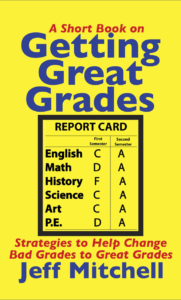 My hope is that the information in Getting Great Grades can be used by current high school and college students and their parents to help the students who may possibly be underperforming academically in school. 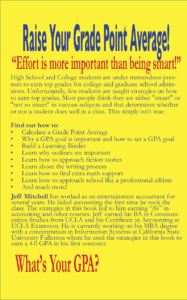 It is my hope that the book will help those students increase their GPA’s and keep as many college options open to them as possible. The book was meant to be somewhat short because most students have enough to read. But I tried to provide enough information that could help a student, who may not be earning the grades they desire, change their approach in a manner that can possibly take their grades to the next level. The information in the book helped me go from failing an accounting class to eventually earning an A in some accounting and other courses. It also helped me earn a 4.0 in my first semester as I began pursuing my Masters in Business Administration at California State University, Fullerton.